Gospel Connection: One thing that Christians can always be sure of is that God will take care of them. The Bible teaches that not a flower or bird escapes God’s notice. God is in control of all of His creation and we never have to worry because God will take care of us. Today’s story is of a widow and her son who were facing starvation. Whenever Elijah asked her to use the last of her flour and oil to make him something to eat she could have refused, stating that she needed to take care of her family first. But instead, she trusted God and feed Elijah. As a result, God took care of the widow, her son, and Elijah by keeping their flour and oil jugs full until it finally rained again. Today our preschoolers will learn that God will always take care of them. Learning Aim: God Takes Care of Us. Open your Bible to 1 Kings 17. Say, Once there was a man named Elijah. Elijah loved the Lord and trusted Him with all his heart. One summer it got really hot and there was a drought. That means that there was no rain for a long time and all the water dried up and there wasn’t any food. Elijah was worried. Show me your best worried face. The widow was worried. Show me your best worried face. But God had a plan to feed Elijah, the widow, and her son. Elijah told the widow to go and make some bread for him first and then make some for herself and her son. God would keep her oil jug and flour jar full until it rained again. Now, the widow was probably still worried, but she trusted that God was going to take care of them. Every single day the widow made bread for Elijah, herself, and her son and they never ran out of bread. It was a miracle! Now everyone was happy. Show me your best happy face. 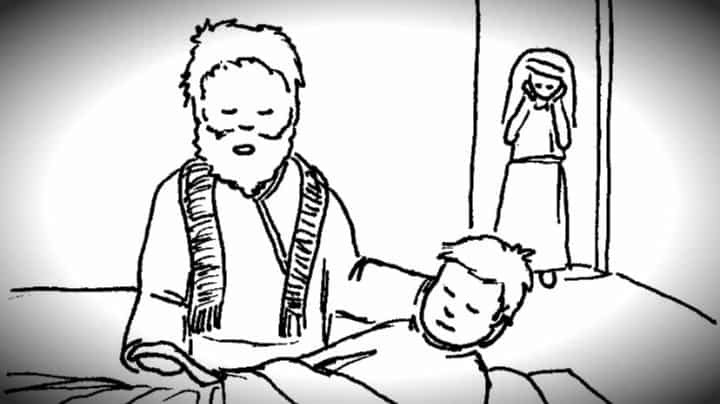 Then, the widow’s son became sick and died. She was very sad and asked Elijah why he let this happen to her. Elijah prayed and her son came back to life! Now everyone was happy because God took care of them! Show me your best happy face. God took care of the widow and He will take care of you also. Fill a plastic container partially full with water and place it on a towel with an empty container. Let the kids fill a sponge with water from the full bucket and then transfer the water to the empty bucket. The sponge soaks up the water just like the sun during a drought. Likewise, the jug of oil should have been empty after the widow made one last loaf of bread but it wasn’t. It kept coming back. Let the kids take turns using the sponge until all the water has been moved to the empty bucket. Say, The widow’s oil should have been empty but God kept refilling it so that they would have food. This was a miracle. God will always take care of you. Place about 1 teaspoon of baby oil in a plastic or Styrofoam bowl. Let the kids dip their fingers in it and then make finger prints on a piece of white computer paper. The fingerprints will fade as they dry but you will still be able to see them if you hold the paper up to the light. The oil in the bowl will go much further than expected. Say, Do you think that the oil in this bowl will be enough for all of us to finger paint? Let’s find out! Today in our story, God made the widow’s oil last until it rained again. He took care of the widow and Elijah and God will take care of you! Give each child playdoh and let them bake their own bread. Talk about how the widow would have had to mix the oil and flour, knead the bread, then bake it. Let the kids make bread with their playdoh and then play as long as they would like. Provide baby dolls, bottles, toy food, and blankets. Encourage the kids to take care of the dolls and make food for them just the widow did. Say, God took care of Elijah and the widow’s family by providing food for them. God takes care of you by giving you a mom and dad to help you. Now it’s your turn to take care of someone else! Say, Today we learned that God will always take care of us. What do you worry about? No matter how big your worries are God will always take care of you. Close in prayer, asking God to help the kids learn to trust God. When I taught this lesson to 4 yr-3rd grade I made unleavened bread with them. Each had a small container of oil(I added a little honey for taste) and a small jar of flour and a small amt of water(I had these in proportion for each to make an approx 5 ” circle. Each had a a small plastic cutting mat to work on(you could buy some vinyl or use wax paper etc. I gave each a Cool whip carton and showed them how to mix their ingredients to make dough and press it out. I had brought my stones to church and we baked them while we talked about the lesson. It was a good visual of how much bread would have been made using the last of the flour and oil and also we each had no more oil or flour to make more. Seeing the small amount of bread and nothing to make more made an impact on how God had truly provided. Tony Kummer (Editor) reviewed & updated this page on : January 29, 2017 at 8:12 am. All our content is peer reviewed by our readers, simply leave a comment on any post suggest an update.